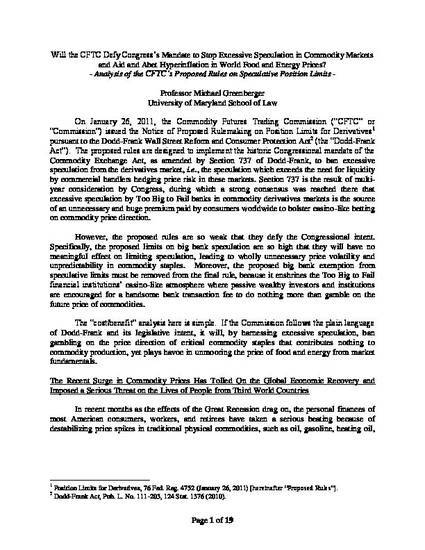 This paper is a revised version of a comment letter submitted to the Commodity Futures Trading Commission. The letter is publicly availabe on the Commission's website. On January 26, 2011, the Commodity Futures Trading Commission issued the Notice of Proposed Rulemaking on Position Limits for Derivatives pursuant to the Dodd-Frank Wall Street Reform and Consumer Protection Act. The proposed rules are designed to implement the historic Congressional mandate of the Commodity Exchange Act, as amended by Section 737 of the Dodd-Frank Act, to ban excessive speculation from the derivatives market, i.e., the speculation which exceeds the need for liquidity by commercial handlers hedging price risk in these markets. Section 737 is the result of multi-year consideration by Congress, during which a strong consensus was reached there that excessive speculation by Too Big to Fail banks in commodity derivatives markets is the source of an unnecessary and huge premium paid by consumers worldwide to bolster casino-like betting on commodity price direction. However, the proposed rules are so weak that they defy the Congressional intent. Specifically, the proposed limits on big bank speculation are so high that they will have no meaningful effect on limiting speculation, leading to wholly unnecessary price volatility and unpredictability in commodity staples. Moreover, the proposed big bank exemption from speculative limits must be removed from the final rule, because it enshrines the Too Big to Fail financial institutions’ casino-like atmosphere where passive wealthy investors and institutions are encouraged for a handsome bank transaction fee to do nothing more than gamble on the future price of commodities.